In the TV series, Star Trek: Voyager, the space ship was the first of its kind to be built with biological circuitry designed to speed up its processing capabilities. What once was science fiction, however, creeps closer to reality as researchers have successfully created a cyborg rose that functions as an electronic circuit. Our first look at cyborg flowers came in late 2015 when researchers at Linköping University in Sweden revealed they had developed the world’s first electronic plant—but it wasn’t made from silicon and solder. Instead, the researchers introduced a synthetic polymer to the flower which was sucked up into its vascular system where it eventually self-assembled into longer chains that could conduct electrical signals. The problem with the original cyborg flower was that the synthetic polymer used had the tendency to clump up as it worked its way through the plant’s vascular tissue, creating organic circuits in limited, localized regions. 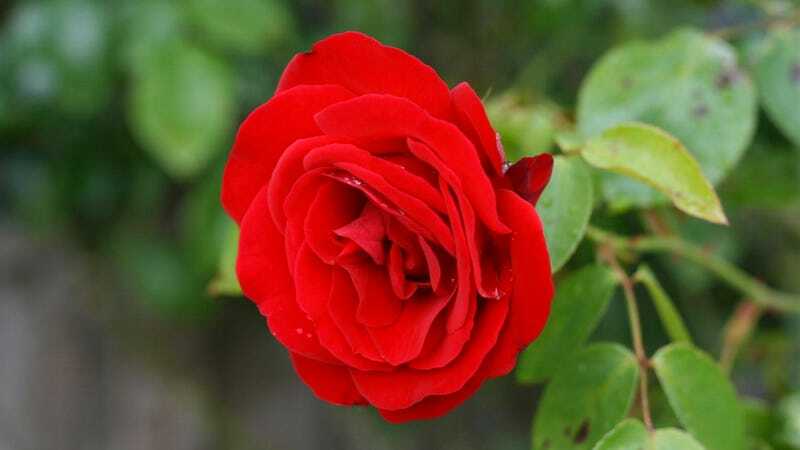 The ultimate goal was to give the entire flower electronic functionality, which led the researchers at Linköping University to develop a different kind of polymer, called an oligomer, for the rose to absorb. The newly developed oligomer was created using bis[3,4 ethylenedioxythiophene]3thiophene butyric acid and 3,4-ethylenedioxythiophene. Don’t bother trying to pronounce that one, you’ll only hurt yourself. What’s important is that the new oligomer has a smaller molecular size, allowing it to make its way through a plant’s entire vascular system, from its stem all the way to its leaves and flowers, where it self-organizes into a complete network of electricity-conducting wires. But that’s not the only advancement in cyborg flowers the researchers made. What’s a piece of electronics without a power source? The oligomer wires that formed inside the electronic rose’s stem all run parallel to each other, separated and insulated by plant cells, which also happen to be rich in electrolytes. On a basic level, those are the key ingredients for creating a supercapacitor—a kind of battery that can hold a massive charge for a short amount of time. The regenerative braking system in an electric car relies on a supercapacitor to temporarily store electricity before it’s sent back to the electric motor to power the vehicle. The advancements made to Linköping University’s electronic plants aren’t quite to the point where you could plug your iPhone into a tree for a quick charge while out hiking. But it does mean that one day we might be growing plants for more than just food or shade. Forests could be turned into vast, sprawling environmental sensors, or a field full of hidden land mines could be revealed and made safe by simply growing a crop of engineered plants over it. Eventually, we might even be able to tap into a plant’s natural photosynthetic processes to generate electricity from the sun, without having to cover acres of land with solar cells.